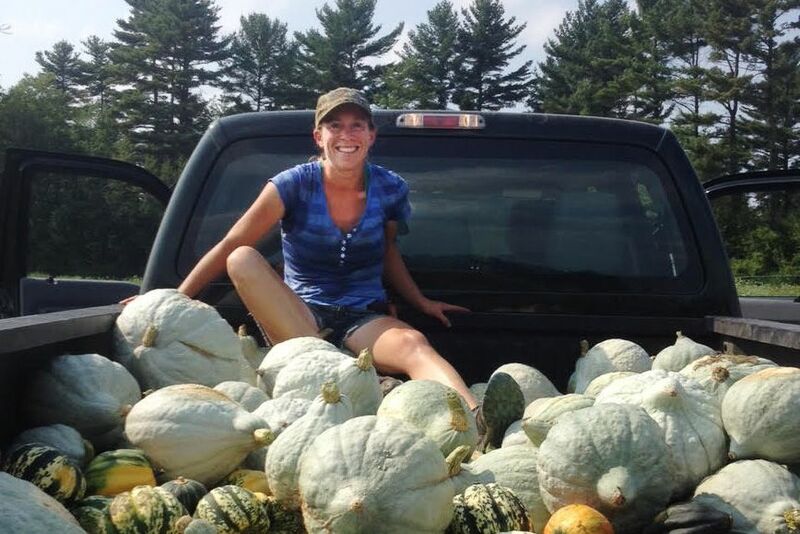 Katherine Creswell reaps the bounty that was the 2015 winter squash harvest. I spent my senior year at Bates 10 years ago trying to answer one question: Can Maine feed itself? Through my year­long environmental studies thesis project, I interviewed farmers, Maine Department of Agriculture representatives, social service agencies, and food distributors trying to figure out the state’s food advantages and challenges. My hypothesis was that Maine could feed itself, if some barriers were removed: high consumer costs, distribution barriers to rural communities, and, most important, a reluctance on behalf of many Mainers to change the way they eat. It is now 10 years later — November 2015 — and I am about to gather a month’s worth of empirical evidence on the relative ease or difficulty of eating completely locally. Katherine Creswell’s story about her month of Maine dining includes the type and amount of each Maine food that she consumed in her two-person household; five recipes featuring Maine-sourced food; and a list of Maine food producers and providers. My challenge: For 30 days, I will consume only foods grown in Maine or processed with 100 percent Maine ingredients, including often-overlooked ingredients such as salt, rennet, and cooking oil. The obstacles: Saying “No” to treats offered by others; making everything from scratch even in time-crunched work weeks; and not overlooking anything — like spices used in sausage. The advantages: I manage a farm and have unlimited access to free vegetables and eggs, I know many food producers around the state, and I like to cook. This morning I drank my last cup of coffee, and just now I ate my last piece of chocolate for the next 30 days. The goals: To expand my cooking repertoire; inspire others to eat more locally; and arrive at an answer to the question that has been nagging me for a decade. It is Nov. 8, a Sunday evening, the night before I intend to swear off all non­-locally grown and produced foods for a month. This morning I drank my last cup of coffee, and just now I ate my last piece of chocolate for the next 30 days. I excitedly think through my menu for the following day, preparing some mashed potatoes with kale, garlic, and onions to take for lunch. I have thought through a lot of the upcoming month, and have a few go­-to recipes in mind as well as some quick snacks and sweet­-tooth-­satisfying desserts (see recipes at the end). The month will yield more than I expect, however, from cooking lessons and the simple joy of sharing a meal, to a more practical take on food security than I had before. I go to bed while cracked oats soak on the stove top. 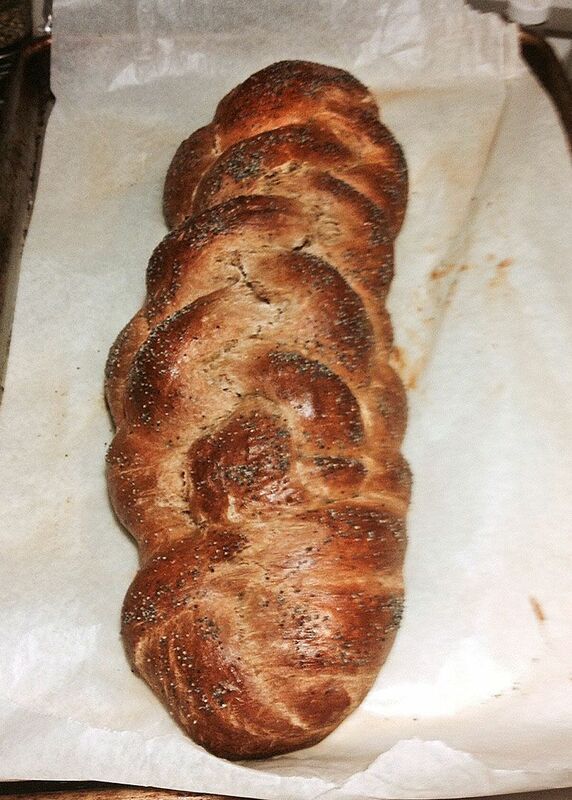 Maine whole wheat challah with poppy seeds. I live on Maine’s mid coast, but work managing a farm outside Waterville, in south-central Maine, necessitating very early mornings, a long commute, and late evenings. Before beginning the diet, I made a list of all of the Maine ingredients I have available to me from the farm: greens, storage crops, popcorn, dry beans, eggs, and herbs. I also listed the items I could obtain from the multi­farm CSA I joined for the month — flour, wheat berries, butter, fruit, milk, sweeteners and meat — and made a short list of the items I needed to locate elsewhere, such as cornmeal and oil. On a typical weekday, I have tonight’s dinner and tomorrow’s lunch complete in 30 minutes by boiling rice when I get home, chopping and sauteing vegetables, and whisking together a flavorful sauce. Without access to my usual arsenal of condiments, and lacking enough of one essential ingredient — time — I would need to add flavor another way. I could no longer rely on those convenient flavor providers of my culinary past, such as soy sauce, miso, chutneys, and curry pastes. I quickly learned that deep, satisfying tastes from a Maine-only flavor palette require long, slow roasting, overnight simmering on the wood stove, and daylong soaking or fermenting. I this spirit, I decide to roast a pound of CSA-sourced chicken thighs, a day ahead, in a Dutch oven with some vegetables. I cut up delicata squash, potatoes, carrots, onions, and garlic, and add them to the pot with the chicken and some sunflower oil. I put it in the oven at 400 F and cook it for over an hour. The dish sets the bar for meal quality for the month with a technique that is simple, roasting, and ingredients that are commonplace for any Mainer, especially if sunflower oil is replaced with butter. I have achieved the flavor I craved through this cooking method, independent of added condiments. The only downside I see is that this cooking method takes a very long time. Halfway through the month, some good friends invite me over for dinner. Not wanting to limit their hospitality, I regretfully decline. But they call back and, being farmers themselves, offer a list of all the Maine products they have at home, so I compromise by offering to bring the main course while they provide the salad. I dreamed up a Maine version of empanadas and had begun preparing them a few days prior. I already had on hand a pie-crust dough with sifted wheat flour, sea salt, a little apple cider vinegar, butter, and water. I had a skillet hash of potatoes, garlic, onion, kale, and ground beef already cooked that I would use for the filling. 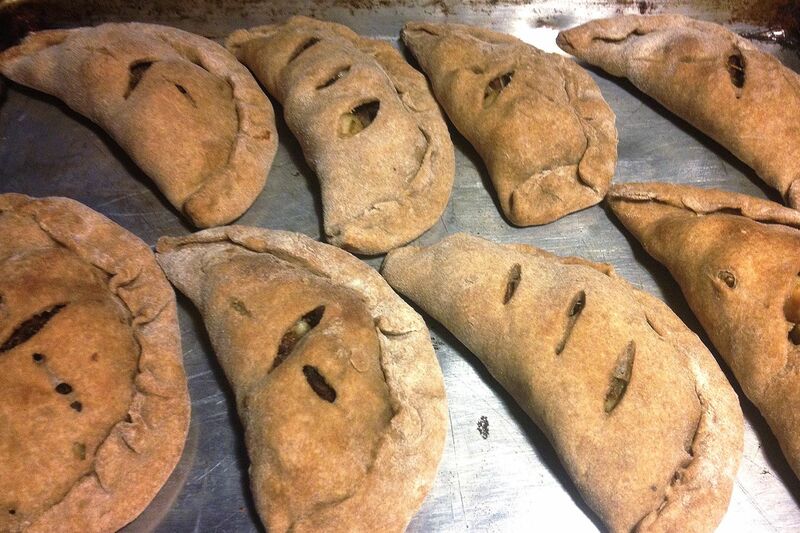 Creswell’s Maine version of empanadas are filled with skillet hash of potatoes, garlic, onion, kale, and ground beef. Two hours before I am due at my friends’ house, all I need to do is assemble the empanadas — the process seems quick and easy. I fold small rounds of crust over small piles of filling into crescent shapes, bake at 350 F, and hope for the best. They come out browned and steaming and look beautiful. I am proud to share them with friends, and feel satisfied to welcome friends into my experiment. As a cook, I prefer plain, whole ingredients. While I am no kitchen coward, I do embrace the quick and easy: boiled rice, quinoa, fast sautés, or, even better, raw vegetables that are the epitome of fast foods. And I am a conservative spice user. Given those predilections, I figured that maintaining my Maine diet would not be an extraordinary feat. Still, as I move through the month, my quest for taste and flavor pushes me throughout my kitchen comfort zone, and I begin to discover what flavors, techniques, satisfaction lie on the other side of quick and easy. By mid-month, I have created some of my most flavorful meals ever as my chosen cuisine benefits from the taste and freshness of all local ingredients combined with the time I have dedicated to preparing them. With a few kitchen successes under my belt and fully charged energy reserves, I am convinced that the Maine diet is sustainable on a practical level. But practical often means simplicity. For one long bike ride, I try granola bars made with rolled oats, butter, salt, and honey, baked in a shallow pan with an egg to hold them together. From the pan, they are tasty, but in my jersey pocket they turn to crumbs. After conducting some research, for my next ride, I stick with milk and honey in a water bottle with great success. Six days from the end of the diet, I reflect on the goals I started out with. I have certainly pushed the boundary of my kitchen comfort zone and am confident that my eating habits will continue to evolve as I keep experimenting with new cooking techniques. However, I’m finding that that I simply don’t want to give up certain foods. After busy work weeks, weekends at my house are precious. This time of year, they are filled with ample reading and long bike rides — and tall cups of coffee. At the outset, I was prepared mentally to enjoy tall cups of herb tea instead, but to those who know, it is just not the same. For me, after a month of Maine-sourced diet, I have a personal answer to my thesis question. While I can sustain myself on Maine foods alone, I don’t want to restrict my diet — which leaves me unconvinced that eating a Maine-source diet is realistic. I think I have a better question than “Can Maine feed itself”? Now, I think I have a better question than “can Maine feed itself.” The better question is How can Mainers eat more local ingredients every day, for their own health and that of the environment and local economy? Anyone can — and many do — grow some of their own produce. They can purchase, trade, or barter with another food producer. They can access some of the 4 million pounds of farm products donated to food pantries around the state. They forage greens, nuts, mushrooms and hunt for game and fish. Still, the barriers to closing Maine’s food loop that I identified a decade ago still remain: higher costs, inadequate distribution, and entrenched eating habits. 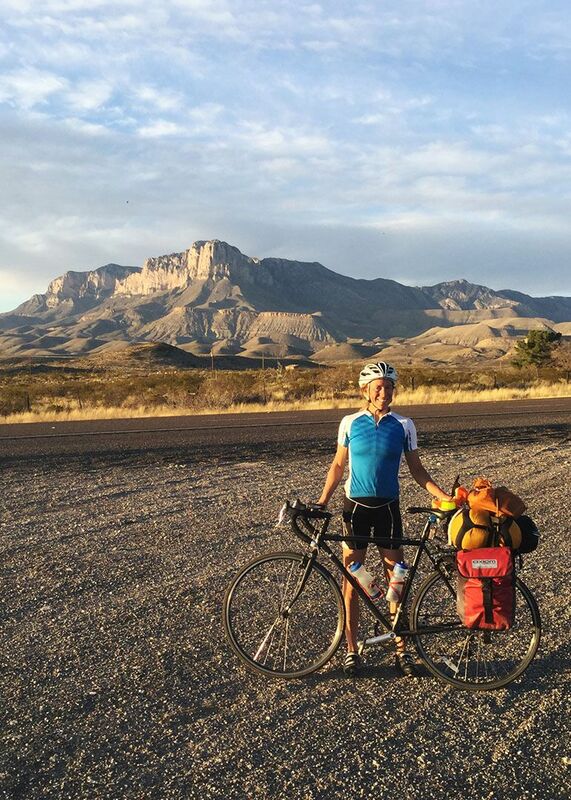 Katherine Creswell, who is on a California-to-Maine bicycle ride, pauses at Guadalupe Mountains National Park in Texas. Me, I will happily resume drinking coffee on weekend mornings and nibbling chocolate toffee holiday treats — in addition to maintaining a well­-stocked pantry of Maine foods. For my health, my community, my environment, and most of all, superior taste, it is an easy decision to consume all of the local items that I have access to. I will always keep a variety of flours and grains around, and I’ll spend a little extra cash on sunflower oil for its superb high heat tolerance and I’ll stick with Maine oats for batches of granola. I’ll substitute local maple syrup and honey for all of my sugar needs, and I’ll probably buy meat every now and again just to support Maine’s hard-working livestock farmers. I will rely on weekly loaves of homemade bread using local flour, and because I can tell the difference in taste, when I buy butter, you can bet it’ll be local. My diet will hover around 70 percent Maine foods, and I will eternally enjoy the rice, chocolate, green tea, raisins, and peanuts that make up the balance. I hope you conclude the same. After managing The Farm at Kennebec Valley Community College and teaching in its sustainable agriculture program for two years, Creswell is now far from any Maine-sources food, enjoying a cross-country bicycle trip. This list shows the Maine-sourced ingredients and amounts used in my household of two people during the challenge month. * I chose not to eat cheese because of rennet. I couldn’t verify the origin of this ingredient for many cheeses. These recipes feature Maine-sourced ingredients. Cook on very low heat butter, oil and salt together until homogenous. Thoroughly mix into oats, then crack in two eggs and fold together. 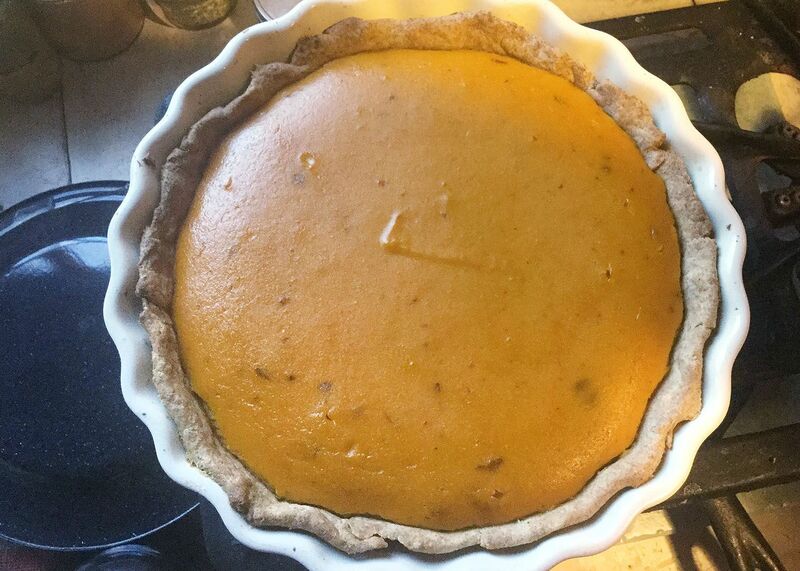 Spread onto a large baking sheet and bake at 300 F for 15 minutes. Stir the granola with a spatula, then bake another 15 minutes. Allow to cool then break into chunks, or stir right away to minimize chunks. Mix all the dry ingredients together, then add the wet ingredients and stir well. Gently stir in the fruit, if using, at the end. Let sit five minutes while you heat a griddle to medium temperature. Onto hot griddle greased with butter, spoon large tablespoons of batter. Cook on each side for two to three minutes. They are wonderful eaten hot with fruit, jam, or syrup, and are still good eaten cold as a snack with yogurt and applesauce, for example. Mix dough ingredients together. Work the butter into the flour with your fingers. Let sit while you prepare the filling. Gently brown meat in a skillet with salt to taste. Remove and set aside. Heat oil in skillet and add chopped onion and garlic; salt to taste. Cook gently until soft. Add diced potatoes and diced carrot and continue to cook gently until potatoes are soft and beginning to brown. Add chopped kale, stir it in, then turn off heat. Kale will wilt in the residual heat. Divide pie dough into 12 evenly sized balls. Roll one out on a lightly floured surface to a diameter of about 8 inches. Place a few tablespoons of filling just beneath the center line. Fold top of dough over filling and press onto bottom with a finger pinch, fork depression, or other method. Score the top of the empanada with a sharp knife (I use different markings to denote different fillings) and set on a baking tray. Load a full baking tray into a 350 F oven and bake about 30 minutes. Empanadas are done when they are slightly brown on the surface. I use a food processor to shred the cabbage and the carrots. Place in a large bowl. Add chopped herbs and stir or shake to mix. Mix vinegar, salt, and hot sauce together and pour over the salad. Eat right away, or allow to sit overnight for a juicier, more complex-tasting salad. This is a “non-exhaustive” list of Maine food producers from whom I purchased products during the Maine Food Month. You can search the MOFGA site for organic CSA farms, and search “winter” for farms selling produce in the winter.